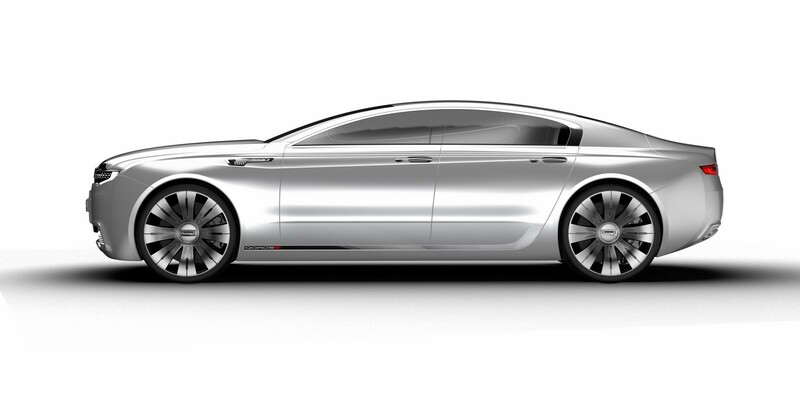 H Qoros παρουσίασε σήμερα το 9 Sedan Concept, ένα πρωτότυπο δημιουργίας ενός νεαρού σχεδιαστή της, το οποίο μας δείχνει το πως θα μοιάζει η μελλοντική ναυαρχίδα της. Σχεδιαστής του ο 29-χρονος Κορεάτης Jihoon Seo ο οποίος μαζί με τους σχεδιαστές της Qoros σχεδίασαν το αυτοκίνητο μέσα σε διάστημα πέντε μηνών, με το πρωτότυπο να απευθύνεται σε 40-50 χρονών επαγγελματίες οι οποίοι ζουν σε μια σύγχρονη μητροπολιτική πόλη του κόσμου το έτος 2020. Η εταιρία έχει δημιουργήσει ένα πήλινο ομοίωμα κλίμακας 1:4,5 το οποίο πρόσφατα παρουσιάστηκε στο Coventry University Degree Show. Υιοθετεί σχεδιαστικές λεπτομέρειες από τα Qoros 3 Sedan και Qoros 3 Hatch, διαθέτει χρωμιομένες λεπτομέρειες, LED xenon φωτιστικά σώματα, τραπεζοειδή γρίλια, LED πίσω φωτιστικά σώματα, ζάντες 19″, με τους πλαϊνούς καθρέπτες να έχουν αντικατασταθεί από κάμερες. 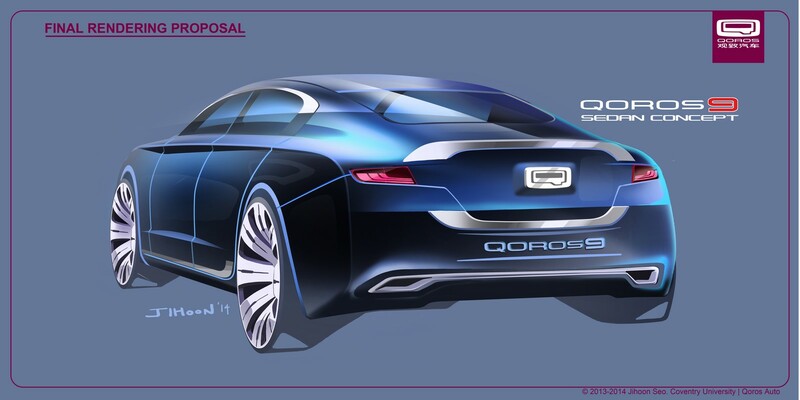 Shanghai, 18 June 2014 – After an internship during which he worked amongst some of the most talented automobile designers in the industry, a design student’s vision of a Qoros for the year 2020 was showcased at the Coventry University Degree Show in the UK earlier this month. Jihoon Seo – a 29-year-old Korean – undertook a five-month spell with the brand’s designers in Shanghai as part of the Qoros Design Team’s internship programme, which offers budding designers the opportunity to develop and refine the skills required to pursue a career in the automotive industry. Qoros then sponsored Seo through his final-year project that represented the culmination of his studies at Coventry University’s School of Art and Design. 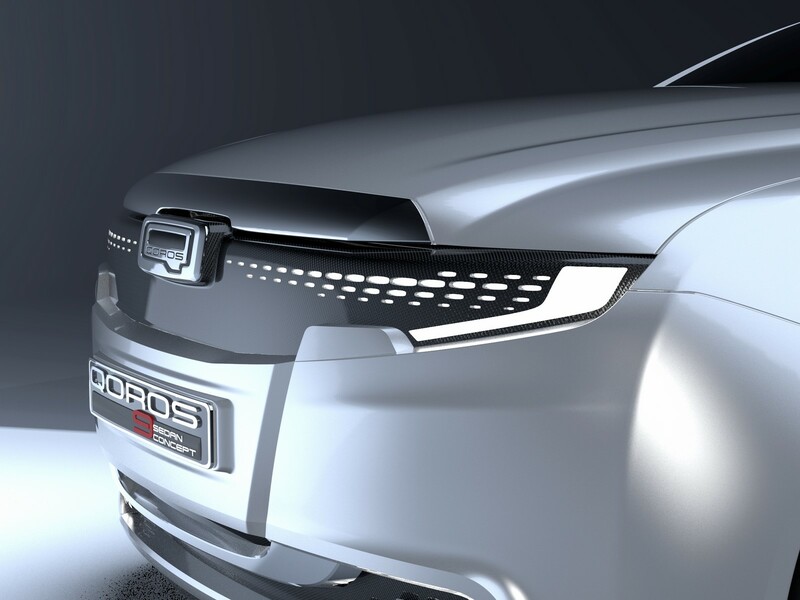 Qoros’ Executive Director of Design, Gert Volker Hildebrand, said: “Qoros is a rapidly growing brand and we are dedicated to helping and educating young, up-and-coming talent. Finding the very best talent will be a crucial success factor for our company in the future. Jihoon is the eighth design intern we have welcomed at Qoros in just the past few years and we will continue to offer internships to the brightest students. “Our internship programme also allows us to give something back, offering the same opportunity today that many of us in the Qoros design team benefited from when we were students or working in our earliest days in automotive design. Jihoon is a very talented young designer and it’s been our pleasure to be involved in helping him on the first steps of his career,” concluded Hildebrand. During his internship, Seo was mentored by Tim Pilsbury (British), Senior Manager of the Qoros design studio in Shanghai, who then also provided him with support, advice and feedback upon his return to the UK and the completion of his degree course. 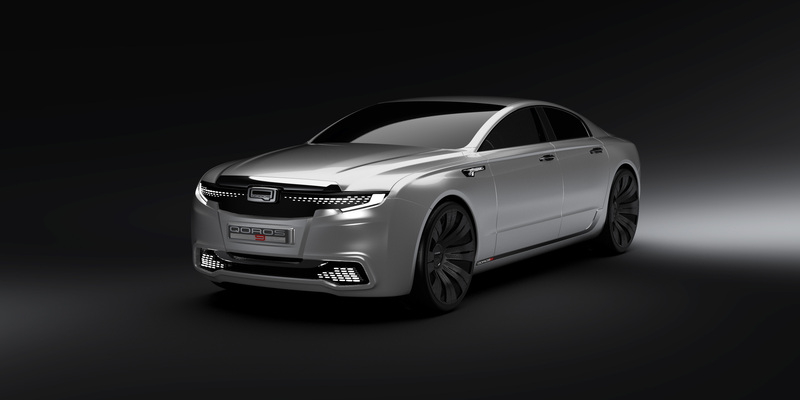 For his final year project, Qoros briefed Seo to create a flagship concept saloon for the new China-based international brand to launch in the year 2020, specifically aimed at 40-50 year-old professionals living in a modern metropolitan city. Unveiled at the Coventry University Degree Show as a 1:4.5 scale clay model, the Qoros 9 Sedan Concept displays a next-generation interpretation of Qoros’ pioneering New Premium philosophy. It exhibits several design cues evident in the brand’s Qoros 3 Sedan – on sale in China and Slovakia since late 2013 – and Qoros 3 Hatch, which will join the Sedan in showrooms in China in the middle of 2014. It also introduces some new concept design themes for the future. Clean horizontal lines and generous proportions give the Qoros 9 Sedan Concept a simple, modern and distinctive look and the present-day Qoros signature hockey-stick design theme is featured in several individual styling elements around the car. The side profile is elegant and powerful, with a bluff leading edge and coupé-like rear, where the C-pillar extends almost all the way to the boot-lid spoiler. At the front a trapezoidal grille with a chrome surround, flanked by powerful LED Xenon headlamps and fog lamps, creates a strong, impactful face. 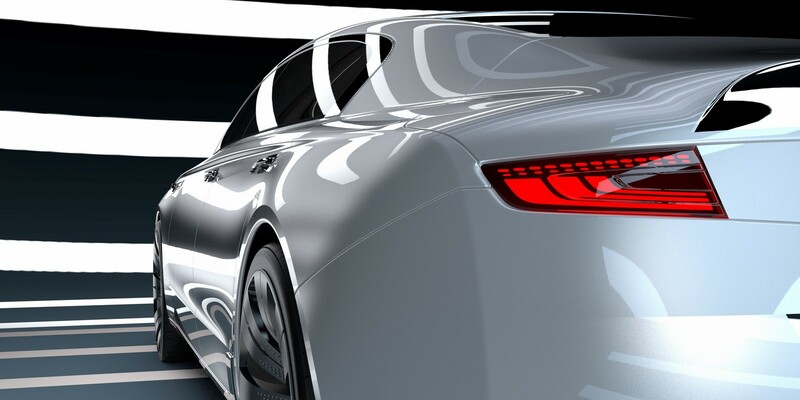 Compact rear combination lights feature three horizontal LED bars to accentuate the car’s width and imposing stature. The Qoros 9 Sedan Concept has no traditional door mirrors; instead, a high-definition rear-view camera is discreetly integrated into the LED side indicator repeater module just below the base of each A-pillar. Perforated and diamond-cut eight-spoke 19-inch alloy wheels exude dynamism and a premium feel. 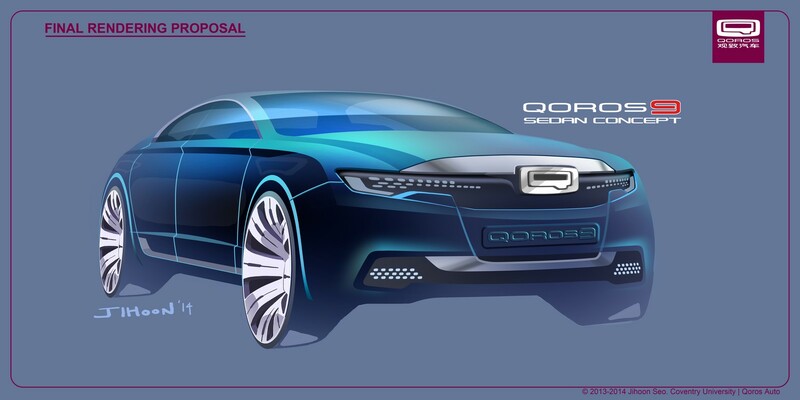 During the Degree Show, Jihoon was bestowed with an award for “Best Flat Work” for his sketches and renderings of the Qoros 9 Sedan Concept. The 2014 awards are sponsored by Wacom, a Japanese company that specialises in graphic tablets, and judged by Automotive and Transportation tutors and students from Coventry University’s School of Art and Design. A video of the Qoros 9 Sedan Concept is available to view at the official Qoros YouTube channel (http://youtu.be/jX0PCE8zrFI).